The shop was a bit like walking back in time. In other words, fabulous. 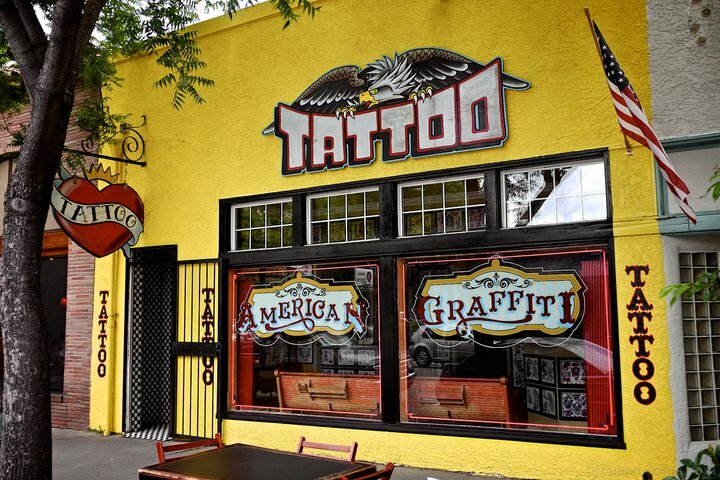 Very clean, professional, great artists, amazing tattoo area, and just a plain ol’ badass shop. I loved everything about it. This was my first tattoo and Sam was my artist. I showed him some pitiful renderings of the hinge tattoo I wanted. Sam worked with me and made the art that was exactly what was in my mind but couldn’t get on paper. I L*OV*E this shop, my artist Sam, and my tattoo. Thanks American Graffiti!!! American Graffiti is legit. The artists are serious about their work and it shows. True talent and professionalism here!